So how to hide more greens? Well lately my family has been into Sliders, which are basically mini burgers. Personally I am a big fan because whenever I eat an entire burger, wether it is turkey, salmon or beef, it’s just to much for me, so mini burgers are great. When you put them on mini-buns it is just naturally kid-sized and cute. Charged with making a bunch of sliders for the freezer at both Nonna’s house and ours, and armed with 2 pounds of ground beef, I decided to get sneaky. I don’t have any photos of the ingredients but it is ridiculously simple. 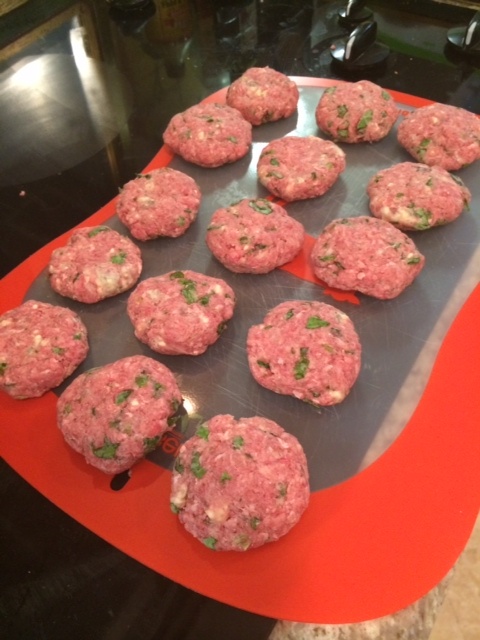 This recipe makes 24 mini slider burgers. Chop the Kale so that the pieces are very small. Put all of the ingredients in a large mixing bowl. Using your hands (after washing them of course) mix the living ….heck….out of it to make sure it is well combined and the cheese is all mushed and mixed in. So I just finished these and will serve some of them tonight (the rest individually wrapped and in a ziplock freezer bag) with some caramelized sweet onions, mushrooms and something else TBD. I am pretty confident they will be a hit as sliders generally are around here!